The other day, a senior journalist (I have no idea which organisation ranks journalists though) remarked that United States President , Barack Obama, like his predecessor, George Bush Jnr, had not done much for Africa. 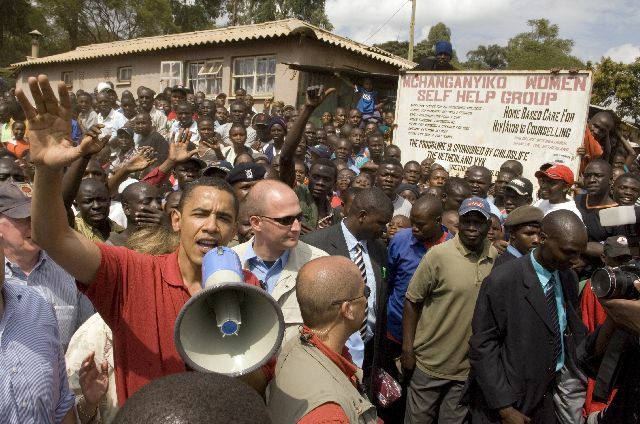 Apparently, Obama, born of an African father of Kenyan origin, making him "our person" . As our person, Obama was supposed to have Africa's agenda somewhere close to his heart, giving it almost as much priority as that of the US. Africa is yet to come to the reality that Obama is a US citizen, voted in by the good people of US to mind about their concerns. If it involves screwing Africa, so be it. In Africa, the concept of someone being ours is taken quite serious. We have resigned to fate bestowing luck and charm on others while overlooking the rest. The lucky ones are expected to remember the unlucky ones, and throw some luck their way. It is for the same reason that the watchmen at the main gate have become quite a bother. I made the mistake of been quite friendly, and I have paid the cost to become the "boss". Alighting late at night, I am accompanied by requests to "buy them tea." Come Christmas and I was accosted by queries of "wapi Christmas (Where's Christmas)", one would have mistaken me for one of Santa's elves. In life, I have been lucky, at times, to get favours from people in other services, especially the public sector. It happens when they ask for my name, and notice that we belong to the same tribe, followed by those four words, "kumbe we ni wetu (Alas, you are one of ours)". The recently held Internet Governance Forum was a recent example, where one of "our people" insisted that we should hang out together during tea breaks, and network amongst "our people". Several institutions, especially government ones, are usually occupied by people of one tribe. In places where there is one tribe, we will narrow down to clans or family, there has to be something about our people. Politicians are expected to toe this line, and most do not disappoint. The president should fill the army with his people to make it more loyal, no one will care if it is less effective to fight over neighbours. Like Kenya's Daniel Moi, the president also has the duty to ensure that his people have the best of roads, even if they barely have any vehicles, and an airport that will barely be utilised , while the National airport is bursting at its seams with overcapacity. However, a tribe will be ready to forgive their front runner if he fails in even providing the basic of necessities , as long as he outdoes the other tribes in use of helicopters, and in pecking order. One Kalonzo Musyoka who has his people fervently rallying behind him, recently marked a silver jubilee in his political career by blowing clouds of dust from a hired helicopter in a constituency that frequently suffers from drought. I really hope my people shall read this post, and share it to their people.